As a fight erupts over plans for a new £30bn high-speed rail link through some of the most scenic parts of southern England, Nick Serpell discovers that a similar battle was fought almost 180 years ago. 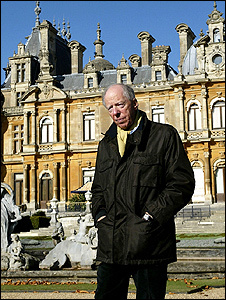 Lord Rothschild is not a happy man. The route for the proposed high-speed rail link between London and Birmingham - the biggest rail project in Britain for more than 100 years - is planned to cross his 5,000 acre estate in the Chilterns. The noble lord has already briefed planning experts to fight the scheme and campaigners are enlisting the support of many wealthy celebrities who have made their homes in this area of outstanding natural beauty, which stretches through Oxfordshire, Buckinghamshire, Bedfordshire and Hertfordshire. These include musician Ozzy Osbourne and the model-turned-author Sophie Dahl. None of this would come as any surprise to the entrepreneurs who built the original London-to-Birmingham railway through the Chilterns back in the 1830s. The opposition then was, if anything, more entrenched than it is today. The railway writer Christian Wolmar says there are distinct parallels between difficulties faced by the original railway and the proposed new high-speed line. "There have always been Nimbys," he says. "In both cases something being constructed in the national interest faced intense local opposition. Nothing has changed." 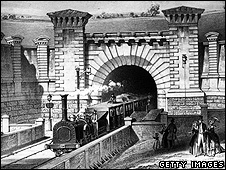 Railways were viewed by many people in the mid 19th Century with a great deal of suspicion. Folk in small rural communities feared the massive social changes that would result from a mode of transport that was many times faster than the horse. Jack Simmons, in his 1991 book The Victorian Railway, quotes a parish clerk's reaction on seeing a railway engine for the first time. "That was a sight to have seen; but one I never care to see again! How much longer shall knowledge be allowed to go on increasing?" Operators of stage coaches and owners of canals feared the railway would destroy their livelihoods by carrying people and goods more quickly and cheaply. However, the bulk of the opposition came from those landowners who occupied estates in the path of the proposed lines. Many believed a clanking smoke-belching train would frighten the cattle, stop their hens laying and ruin their fox hunting, as well as spoiling the view from their front windows. Surveyors mapping out the route often worked at night to avoid being physically attacked by gangs recruited by wealthy landowners, eager to keep the rails off their property. The London and Birmingham Railway Company had recruited the famous engineers George and Robert Stephenson to oversee construction of the line, but an Act of Parliament had to be obtained before construction could start. The first attempt failed when, in 1832, the House of Lords threw out the proposal because "the directors had not made out a case which would warrant the forcing of the proposed railway through the lands and properties of distinguished landowners". Those distinguished landowners were very vocal in their opposition. Sir Astley Cooper, surgeon to George IV, who owned land at Berkhamsted in Hertfordshire, was in no doubt as to the detrimental effect of the "fire horse." "You are proposing to cut up our estates in all directions for the purpose of making an unnecessary road," he told Robert Stephenson. "If this sort of thing be permitted to go on, you will in a very few years destroy the nobility." There was only one way to deal with this opposition - and that was by the use of the cheque book. It is estimated the London and Birmingham ended up paying £320 per acre for the thin strips of land necessary for the track, the equivalent of around £16,000 per acre in today's money. The London and Birmingham spent a fifth of its entire share capital paying off landowners, says Mr Wolmar in his book Fire and Steam, a study of the social impact of the railways. "It was just a form of bribery," he adds. In many cases the land was completely unsuitable for agriculture and worth nothing like the sum the railway company had to pay. Where land could not be bought, expensive diversions were built. A mile long tunnel had to be constructed near Watford so that the new railway avoided the estates of Lords Essex and Clarendon. In the end the London and Birmingham's spending paid off and a second bill to allow the construction of the railway went through Parliament with little opposition. The new line was finally opened on 17 September, 1838, just six years after the proposal had first been put to Parliament. Given the complexities of today's planning process, and the strength of opposition, that is a time scale that supporters of the high speed link can only dream of.